Then Jacob called his sons, and said: “Gather around, that I may tell you what will happen to you in days to come. then you defiled it—you went up onto my couch! All these are the twelve tribes of Israel, and this is what their father said to them when he blessed them, blessing each one of them with a suitable blessing. Then he charged them, saying to them, “I am about to be gathered to my people. Bury me with my ancestors—in the cave in the field of Ephron the Hittite, in the cave in the field at Machpelah, near Mamre, in the land of Canaan, in the field that Abraham bought from Ephron the Hittite as a burial site. There Abraham and his wife Sarah were buried; there Isaac and his wife Rebekah were buried; and there I buried Leah— the field and the cave that is in it were purchased from the Hittites.” When Jacob ended his charge to his sons, he drew up his feet into the bed, breathed his last, and was gathered to his people. When any of you has a grievance against another, do you dare to take it to court before the unrighteous, instead of taking it before the saints? Do you not know that the saints will judge the world? And if the world is to be judged by you, are you incompetent to try trivial cases? Do you not know that we are to judge angels—to say nothing of ordinary matters? If you have ordinary cases, then, do you appoint as judges those who have no standing in the church? I say this to your shame. Can it be that there is no one among you wise enough to decide between one believer and another, but a believer goes to court against a believer—and before unbelievers at that? In fact, to have lawsuits at all with one another is already a defeat for you. Why not rather be wronged? Why not rather be defrauded? But you yourselves wrong and defraud—and believers at that. Do you not know that wrongdoers will not inherit the kingdom of God? Do not be deceived! Fornicators, idolaters, adulterers, male prostitutes, sodomites, thieves, the greedy, drunkards, revilers, robbers—none of these will inherit the kingdom of God. And this is what some of you used to be. But you were washed, you were sanctified, you were justified in the name of the Lord Jesus Christ and in the Spirit of our God. The Ancient Hebrews, as well as other cultures, believed that the patriarchs and matriarchs of families had the power and responsibility to pass on both their material possessions as well as their prophetic blessing to their children before they passed. They took this act seriously, perhaps Jacob more than others. After all, he had used trickery as a young man to steal away the blessing from his brother Esau. Most of Western civilization has diluted this down to wills and financial inheritance, although there are a number of rural pockets where inheriting land is still more important than inheriting money. We shall find out soon what the millennial generation decides to do with the land they inherit. Land, and the older kinds of inheritance are more than physical property and possessions. They are symbols of values like hard work, stewardship, clean living, hospitality, and caring for your community. A farm does not work itself, and even with hired work, you still have to handle the occasional crisis, care for the workers, and recognize how dependent you are on God sending the right weather at the right time. So Jacob/Israel was tasked with distributing out the futures of his 12 sons. He needed wisdom to give them hope and direction for things they actually could and would take care of… and at this point in their lives, they had precious little material goods other than what Egypt had given them. These prophetic futures for them and their families were some of the best he had to offer to them. What kinds of prophetic hopes are you passing down and calling out in your family? It takes Godly wisdom to do this well. It takes God’s help. It may seem impossible, but with God all things are possible, and, more to the point, it is our responsibility to do it, for if we will not pass on God’s blessing to our own family, who will? Perhaps this is part of Paul’s frustrations with the believers in Corinth, who could not judge between themselves on petty disputes and were going to the pagan judges to arbitrate for them. With disputes about property ownership (and you know there was some of that) between literal family members as well as family in Christ, surely they could have found a way to let Christ arbitrate for them. Alas, they could not, or would not. They were too used to going before human judges who could be persuaded with fancy words or bribes, in order to get their way. They gave up better judgment and settled for a battle of the most persuasive. We make a mistake running toward Christ’s mercy and away from His judgment. Our mistake is thinking they are two separate things. God judges us with mercy so we need not fear going to Him. 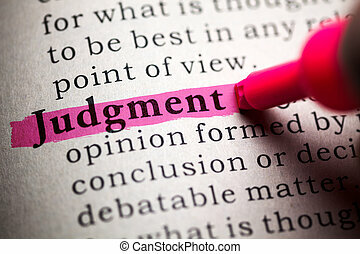 It is also merciful that He judges us at all, because his judgement is not just having a passing opinion on us. God acts in His judgments and makes a difference in our lives. A cruel or uncaring judge would leave us in our own messes. Our merciful judge shows us where we are wrong and lifts us up by His power into right living. God is indeed a better judge than we could ever be or ever find, and it is only our sinful foolishness that fights against Him. Where do you seek God’s judgment in your life? How do you connect with Christ in a way as to receive His wisdom and guidance?